Aloha! That word always seemed like one of those words I only heard in Elvis movies, yet from the moment I stepped off the plane, it is the word that begins and ends every sentence in this beautiful state. I was reading an article about Duke Kahanamoka, considered the father of surfing, and he said, “Aloha means ‘with love’. People meet you with it and send you off with it. I believe in it and it is my creed. Aloha to you!”I like that. 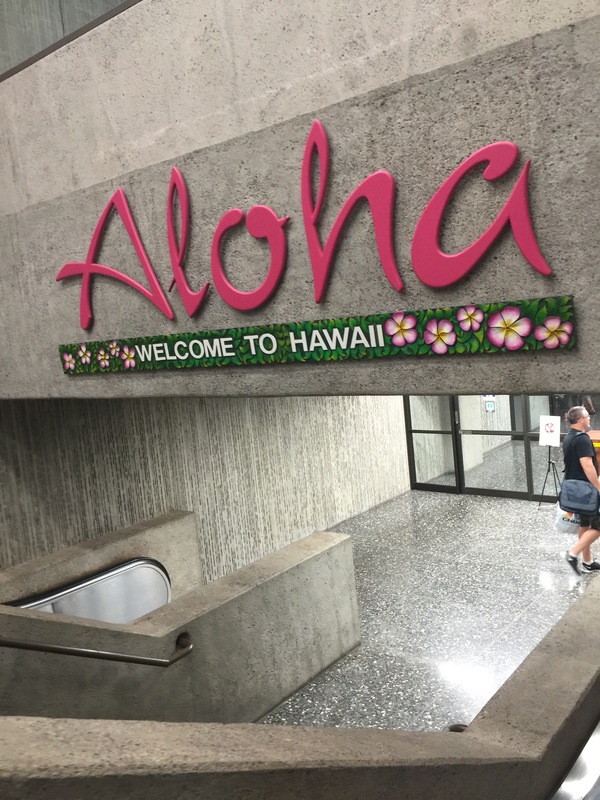 We rented a Jeep at the airport and headed to our hotel- the Hilton Hawaiian Village Waikiki Beach Resort in the Tapas Tower. This place is considered a resort, but I call it a city! There must be 20 restaurants, over 100 stores, and five pools- it is massive and sprawling! Since we were caught up in the time-change funk, we rose at around 4:30am. After the ultimate parking challenge, we went for Saturday breakfast at the Hula Grill, a chain popular throughout the Hawaiian Islands. The view was fantastic, and the breakfast fare was all Hawaiian- and delicious! I ordered eggs Benedict with Hau’ula tomatoes and spinach on a toasted bao bun, and fresh papaya & pineapple. This was a far cry from my normal nutri grain bar! Delicious. The next stop was the Diamond Head Crater. We got there by 8:30am, but the lots were already full! Realizing I left my nitroglycerin tabs at home, (I have a slight heart condition that does not appreciate strenuous hikes) I opted to drop off Jim & the folks we were with and go find something solo to do in lieu of a mega hike up. The ancient volcanic crater, however, was beautiful even from the ground! 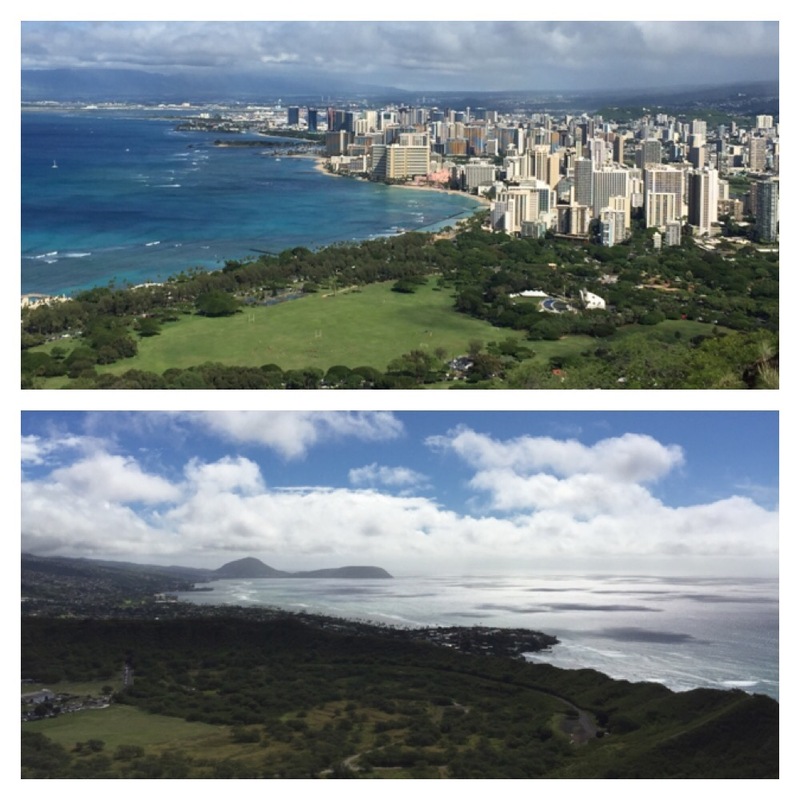 Here are a couple photos from the top taken by my husband Jim. Breathtaking comes to mind!? 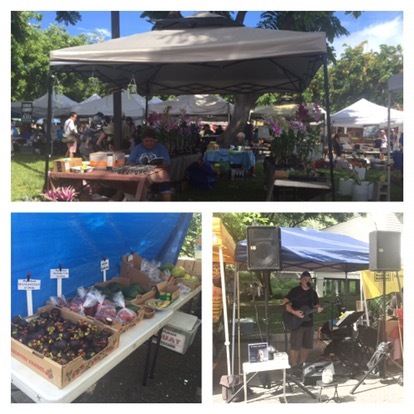 While they hiked, I tooled around and happened upon the local KCC Farmer’s Market, which was organized by the Hawaiian Farm Bureau on the campus of Kapiolani Community College. The campus was beautiful and I wandered through their cactus gardens before hitting the market. 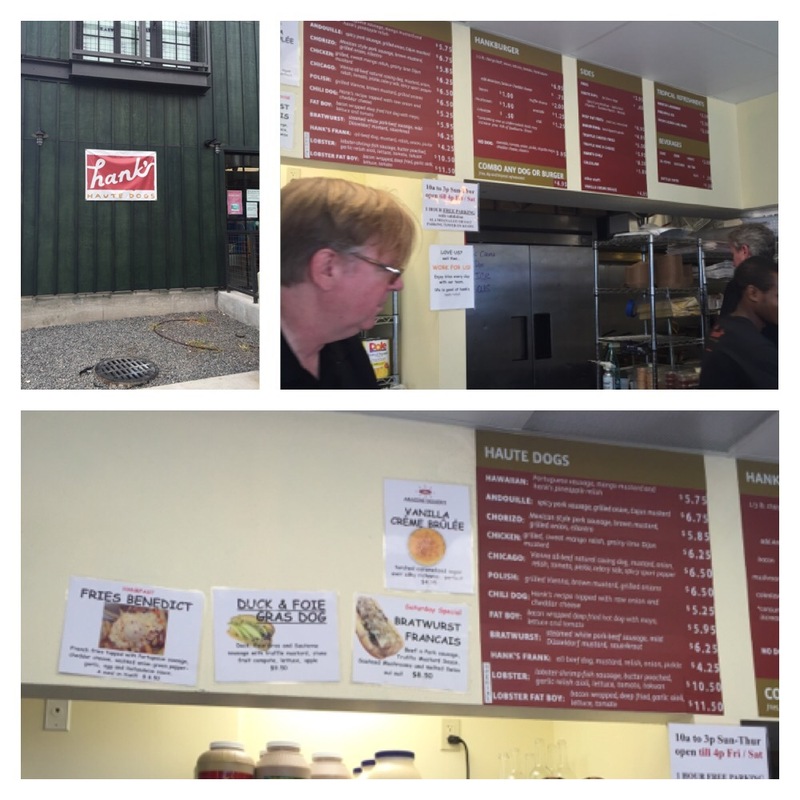 The market was both entertaining and delicious. People drank fresh pineapple juice right out of the fruit. I listened to a local musician play his original songs, I talked to a local farmer, and I sampled some amazing local honey! My favorite samples had to come from the macadamia nut table where I sampled over 15 different flavors! I bought the onion garlic flavor- but I could have gone NUTS! The market is open every Saturday. 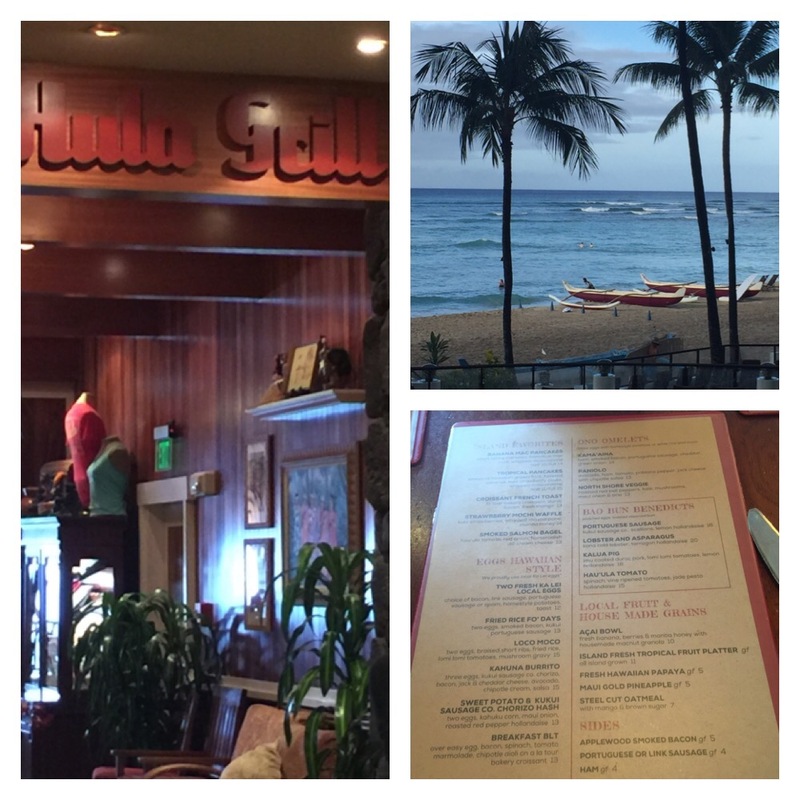 Brandi-Ann Uyemura reviewed the market for Hawaii.comand said, “this market is like a shopping mall for the foodie and a hotspot for Saturday brunch.” Totally agree, Ms. Uyemura! Once I picked up the Diamond Point hikers, we headed to Tantalus Road to make the Round Top drive. We took the top off the jeep for the ride- not the least bit easy- and set out on the steep, curvy jaunt to the top. We stopped at a beautiful lookout spot to take in the views on the way up. 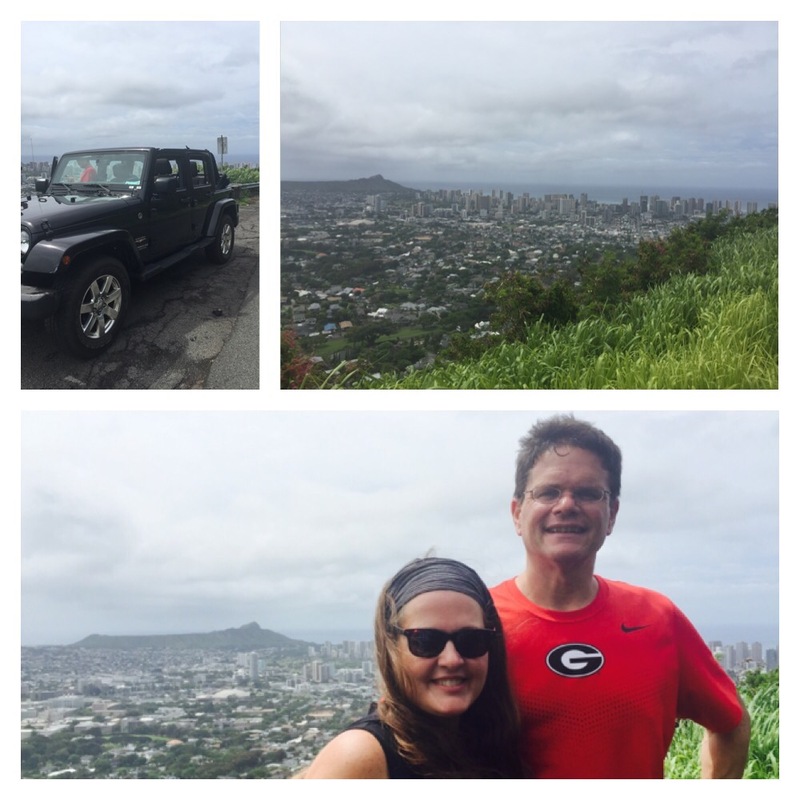 We had a great view of Diamond Head, the Punchbowl Crater, and downtown Honolulu. We continued up, and the open jeep was amazing… until the rains came! Without any more pull offs, and crazy, cliff- hanging cottages lining one side, all we could do was embrace the rain until we got to the top! 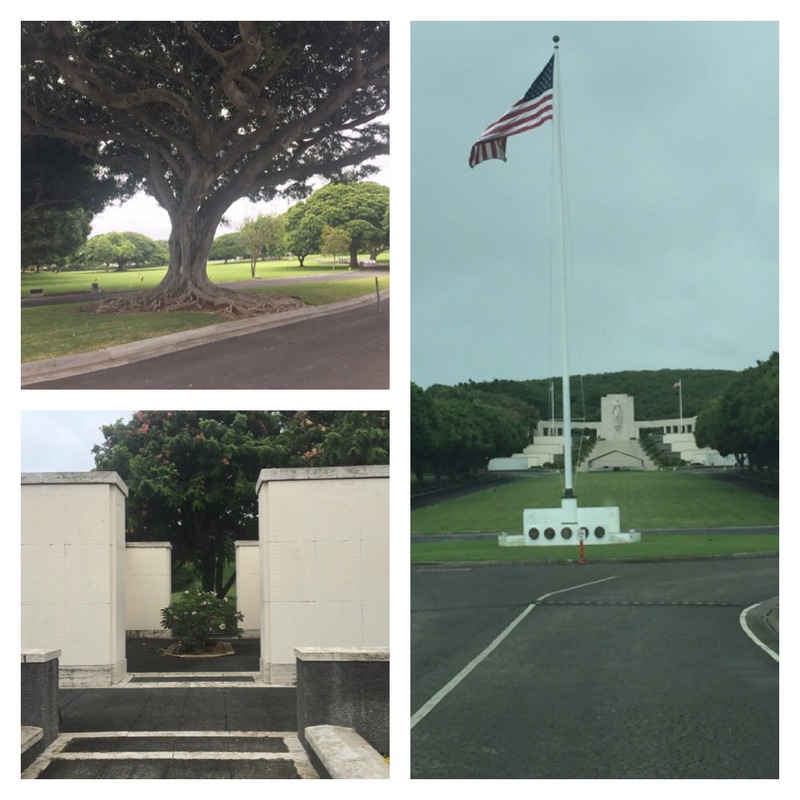 After making our way back down, we drove to the National Memorial Cemetery of the Pacific, also known as the Punchbowl Cemetery, because the site sits in the crater of surrounding volcanoes. In Hawaiian, the term “punchbowl” is “Puowaina” which means “Hill of Sacrifice”. This is a befitting name for this beautiful, solemn resting place of over 13,000 soldiers and sailors who died in WWII. There are also 70 generic “unknown” markers for the graves of soldiers who died at Pearl Harbor. As we approached Lolani Palace, my attention was momentarily interrupted by a drunk guy who was dancing and waving to me on the palace lawn. 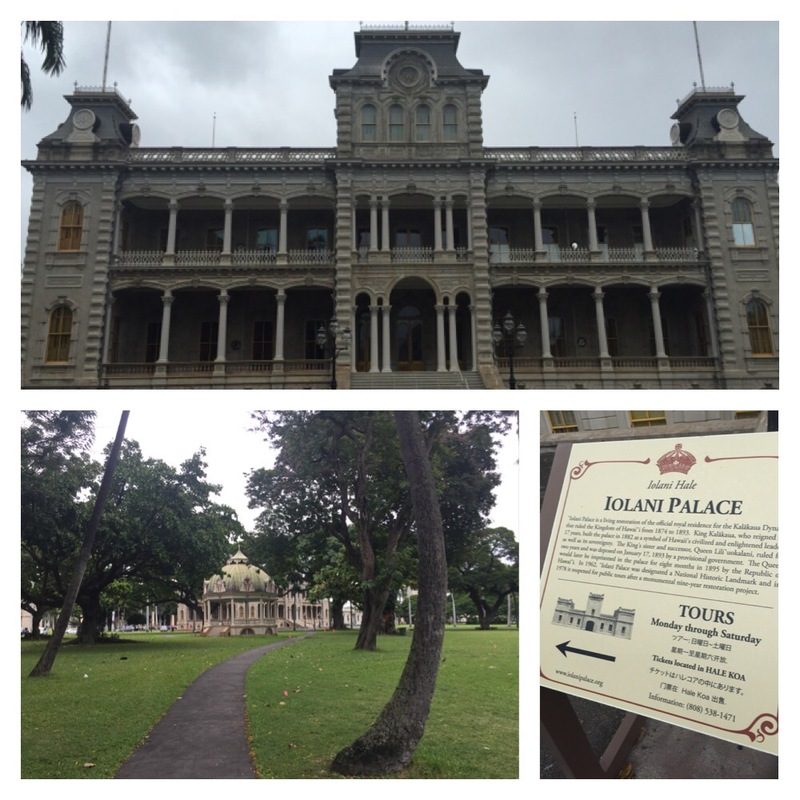 This palace was once the original residence of the King Kalakaua and Queen Lili’uokalani, who were the last monarchs of Hawaii. Also on the grounds is the famous gazebo, which was built for inaugurations, and is now used for local concerts and weddings. 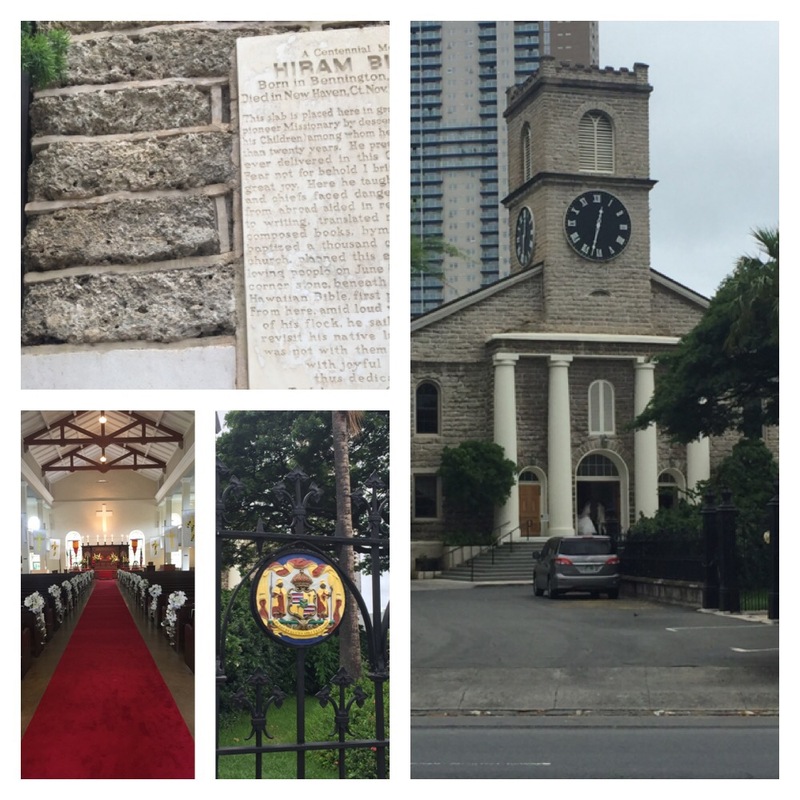 Down the street from the palace sits Kawaiahao Church, which is the first Christian church built on Oahu in 1842. The church is sometimes referred to as the “Westminster Abbey of the Pacific”. The coolest part of the church is that it was built by missionaries using 14,000 pounds of coral slabs from ocean reefs. There was a bride and groom getting photos taken when we arrived. The groom looked about 65 and the bride in her twenties. We thought it might be a father daughter until they kissed. Nope. Definitely a couple! 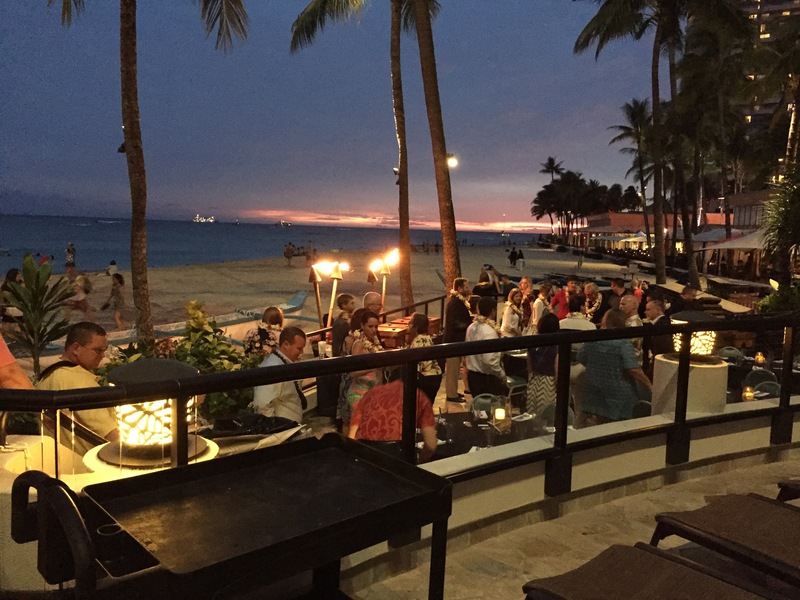 Our day ended with the conferment ceremony for the 2016 CPCU designees- the reason we were flown to Hawaii! The Hawaii Conference Center was the biggest my eyes have ever witnessed; 15,000 people awaited the start of the event. The keynote speaker was journalist John Quinones, the host of “What would You Do?” and numerous other award-winning pieces. His message was powerful: we must model integrity and kindness. He was at once inspiring, funny, and heartfelt, and his own story was one of struggle and hard work. I videotaped several tidbits to share with my newspaper students when I get home. After the ceremony, Jim’s CEO put the Crawford & Company people on a shuttle to Duke’s Restaurant, where we were escorted out past the pool to a private dining area directly on the Pacific. Tiki torches lined the walls, and a gorgeous Laie was placed around each of our necks. We had cheeses and shrimp appetizers, all the Mai Tais we could drink, and a beautiful buffet of Hawaiian fare including fresh caught Mahimahi. And to think… this was just our first full day… more adventure awaits! Can a vivid dream seemingly uncover a long, lost treasure?